Article first published as Movie Review: Laid to Rest on Blogcritics. A young woman (Bobbie Sue Luther) wakes up inside of a coffin with no recollection of who she is or how she got there and she is, perhaps understandably, a little freaked out about the whole thing. After breaking free, she ends up on the run from the lunatic who put her there. It’s a screamy, amnesiac against a dangerous madman wearing a chrome skull mask and it’s no holds barred. There are a few things to recommend Laid to Rest, although it is ultimately a subpar horror flick. For every obnoxious, cardboard cutout character, there’s someone who I actually cared about. Tucker (Kevin Gage) felt like a human being and I was actually concerned about his well being. Steven (Sean Whalen) was a quirky nerd whose bizarre idiosyncrasies weren’t overwhelming or obnoxious. I ended up liking them a fair amount, making it nerve-wracking when they were put in danger. Of course, to balance this out, the script called for them to do mind numbingly dumb things that made me want to slap the stupid out of the movie. Tucker spends a lot of time telling everyone they need to stick together and then wanders off on a whim to split up the group. There was also the character who pointed a gun at the killer and then allowed the killer to walk up to him and shoot him with his own gun. Every brain-bendingly stupid action felt like the director was just padding out the film, adding precious minutes to the run time. 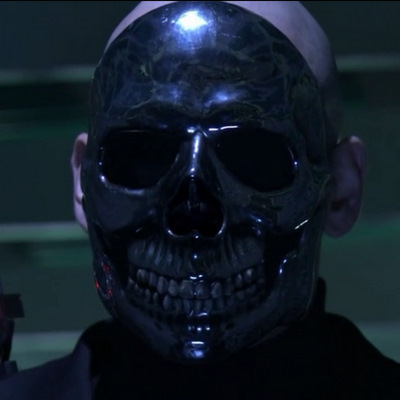 Speaking of the killer, he was strangely lackluster for a guy wearing a metal skull mask. Beyond the fact that he liked his camcorder and was on the sadistic side, there’s not much going for him. He had no real hook or personality. He was just the Killer of the Week, another loony in a mask to cover the camera in blood ‘n’ guts. And lord, were there blood ‘n’ guts. This was probably one of the more gruesome movies I’ve seen in a while, with scenes that genuinely shocked me with how brutal they were. Generally speaking, I don’t need to see people putting their guts back where they belong. Less show, more tell when it comes to eviscerations. If you’re a fan of goo, then you’re in the right place. There’s a lot to see and it’s extremely well done, with faces, heads, and limbs a’flying every which-a-way. Even more off-putting than the gore, was the first ten minutes, where we’re treated to a schizophrenic’s view of reality. The amount of edits and jump cuts is jarring and there are spaces of time where I was unable to piece together what happened. Someone gets stabbed in the eye, but god only knows how that happened. For all that, Laid to Rest was not as bad as I was expecting. Decent acting, engaging characters and a ruthless, viscious killer hunting those characters kept me engaged for the duration, but I won’t be thinking about it after I submit this review.